The Royal Canadian Mint have launched a new series of coins which features some of Canada’s more well-known songbirds. 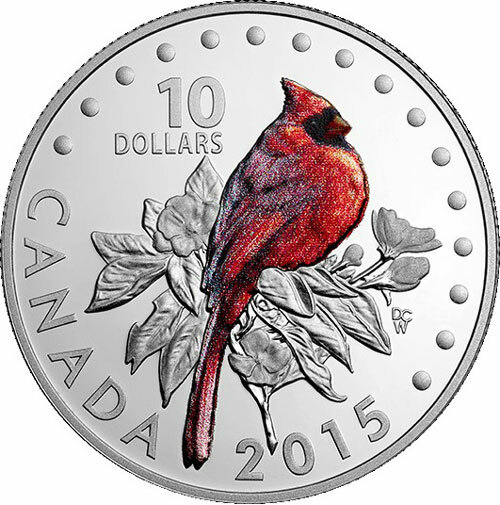 The first coin in this series is the Northern Cardinal. With its brilliant red plumage and a distinctive crest atop its head, the Northern Cardinal easily draws attention to itself wherever it is found. From southern Manitoba east to the Atlantic provinces, the beloved cardinal is one of many colorful songbird species that are testament to the inspiring beauty of nature in Canada. Male songbirds are the ones who sing, but not so for the northern cardinal! Both the female and the male northern cardinal sing, using a variety of melodies to communicate. The northern cardinal’s different calls have been described as a metallic chip when the birds are excited, and a series of down-slurred whistles. The northern cardinal’s call makes its presence, even if it’s well-hidden from view. Northern Cardinals can be surprisingly territorial, especially during the breeding season. It’s not unusual to see a northern cardinal attack its own reflection if it feels compelled to defend its territory against this intruder. The reverse design by Canadian artist Derek C. Wicks features a beautiful rendition of a northern cardinal in a tranquil setting. Finely detailed engraving showcases the songbird’s distinctive features from the pointed crest atop its head to its thick, short bill, as well as the soft feathers that lead to its tail. The use of selective coloring recreates the northern cardinal’s brilliant red plumage viewed in three-quarter profile, as the bird sits nestled amidst engraved leaves and flower blossoms. The obverse includes the effigy of HM Queen Elizabeth II as designed by Susanna Blunt and in use on circulation and commemorative Canadian coins since 2003. The coin is available as an individual purchase or as a subscription with a total of five coins completing the set. Subscribers will receive a free musical box to store your five coins which will be shipped with the fifth and final coin.